“Love is officially in the air”… Its February, already! Where did January go? Now that we are done with the football mania, most of us are falling into love, all over again with Valentine’s day just around the corner. Whether you are a head in the clouds romantic or a non believer, aBUSY super woman kind mom or a girl waiting to meet her Prince Charming, fact is there is no escaping the pink and red world we have been witnessing since the last week! No matter what your RQ (romance quotient), chances are if you are a blogger, you have something planned for Valentine’s day too. 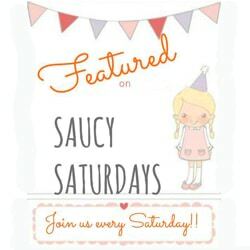 In the spirit of that universal love, we at ‪Saucy Saturday‬ are celebrating it for the next two weeks! This Sat , today we are going to hosting a valentines day themed party. So if you are a blogger ,food blogger, diy crafts decor bloggers , please come join us this Saturday and bring your favorite VALENTINE DAY recipes or decor posts! The top 5 Featured bloggers will receive social media love all week!!! And we wanted to thank you guys for spreading word about us and making us such a hit! We nearly tripled in links last week and it simply wouldn’t have been possible without all you amazing people. I hope you have a wonderful weekend and Valentines Day Swayam! Thanks for including my recipe in #SaucySaturdays Swayam! It’s so fun to find new (to me) amazing blogs 🙂 Happy Valentine’s Day!